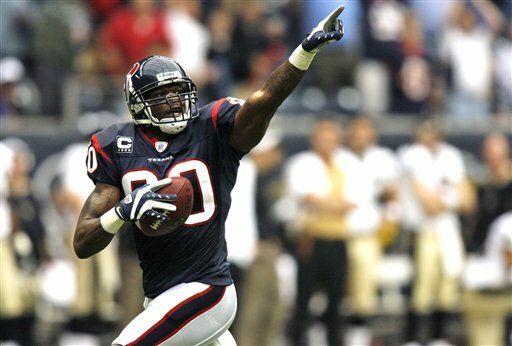 Andre Johnson caught his fourth pass of the game on Sunday and began running to gain more yards until without being tackled he collapsed by himself. Watching him hit the ground fans, fantasy owners, coaches, and players held their breaths. At first glance and even with replay the fall that Johnson had definitely showed an injury but even worse; a torn ACL or MCL. That’s what it looked like at the first couple glances, however luckily for Johnson and the Houston Texans organization after several tests and an MRI they would find out that it wasn’t a torn ACL or MCL and that Johnson would return this season. The question was; how long? The injury would be revealed as a hamstring injury and that Johnson would have to undergo surgery and the recovery time would be two to three weeks. Though more reports would come out later saying that Johnson did have surgery and that he was going to be healthy within three weeks and that the target date is October 30th week 8 against the Jacksonville Jaguars. However nothings certain as unfortunately setbacks can happen especially with hamstring injuries, just ask his teammate Arian Foster. Foster who has been dealing with a nagging hamstring injury all season long has finally appeared to have overcame it after his last week performance of 155 yards and a touchdown off of 30 carries. The injury took about over five weeks total to recover from for Foster and who knows it may not even be fully healed. So for Johnson a two to three week time table is just an educated guess. Facing the facts and looking at reality the injury will probably last about four to five weeks until Johnson is fully recovered, at least that would be the smart approach. Though we can’t compare this injury to Foster’s because we don’t know if there similar, yes they are both hamstring injuries but they could be different tears that are/were in them. Now if Johnson was to take the same approach as Foster and post a picture of his MRI up on twitter too then we would know. But as of right now @Johnson80 hasn’t posted any MRI’s or any tweets at all. Expected Recovery Time: Five weeks; putting a target date for their game against Cleveland or Tampa Bay. But with a week 11 bye the Texans could take the safe approach and hold him out an extra week. But sitting at 3-1 and tied for first place in their division the Texans are fine for now but depending on how their next couple games go, they might have to rush their star player back as soon as possible. It Was AMAZING. Don’t Worry Ocho I Have Your Back! “Just waking up after a late arrival,I’ve never seen a machine operate like that n person,to see video game numbers put up n person was WOW,” Ochocinco tweeted when he woke up talking about his new quarterback Tom Brady. Brady threw for 517 yards, four touchdowns, and one interception in 38-24 win on Monday Night over the Miami Dolphins. As for Ochocinco he only caught one ball for 14 yards. After the tweet hit the internet ESPN NFL analyst and former New England Patriots linebacker, Tedy Bruschi who respond. “You’re not someone who’s on another team or watching TV,” Bruschi said. “You’re not an analyst. You’re a part of it. They want you to be a part of it. So get with the program because obviously you’re not getting it and you’re tweeting because you’re saying, ‘It’s amazing to see’? It’s amazing to see because you don’t understand it. You still don’t understand it and it’s amazing to you because you can’t get it. Well I don’t know if Bruschi was watching the same game that the rest of the world was watching, but it was amazing. 517 yards and four touchdowns, including a 99 yard touchdown pass to Wes Welker all in one game now THAT”S AMAZING. Throughout all of the years of football, all of the games, all of the players to play quarterback in the NFL, only ten of them threw for 500 yards or more in one game. To top it all off Brady’s game stands in the books as the 5th most passing yards in one game. Now I don’t know about you Tedy Bruschi but that sounds pretty amazing to me. But hang on Bruschi we’re not done yet; let’s talk about you now. You have no room to talk about Ochocinco “not performing well” or whatever you want to call it, because you don’t have that right. You also don’t have the right to call him a fan, because you know what, YOU”RE THE FAN; he’s the player. So what he had a bad game, it happens. Keep in mind to that this was his first real full game as a Patriot. Remember in 2008 your last season in the NFL during your the last three games against the Raiders, Cardinals, and Bills you didn’t have ONE tackle, not even an assisted tackle? Remember that? And you spent 14years in that defense and you didn’t have one total tackle in three games! Three games! Therefore Tedy Bruschi don’t say a word, or a peep, or anything about Ochocinco ever again because you can’t. He’s better than you are and I know that hurts but its okay. Just remember one thing Bruschi you were on his twitter page, looking at his comments; you’re the fan. So WAKE UP and smell the coffee Bruschi because it doesn’t really smell like your flavor. 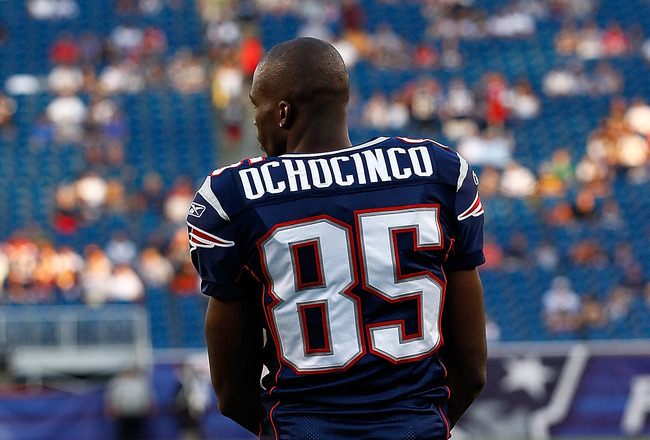 So like Ochocinco would say it; Tedy Bruschi CHILD PLEASE.